Geocaching has been around since 2000 but it has become increasingly popular over the last few years, particularly with families looking for fun outdoor recreational activities. Although intrigued by the concept, I have to admit that I have been too nervous to try it myself. With my poor sense of direction, I didn’t feel very confident that I would be able to find a cache and I had a niggling fear that I might become well and truly lost in the woods while searching. My 13 year-old daughter had no such qualms though, so we made plans to spend a day geocaching in early October. So what is Geocaching? Essentially it is a high tech scavenger hunt where the object is to find a hidden treasure (cache) using GPS coordinates. All you need to get started is your GPS enabled cellphone and a free account at Geocaching.com. Once you have created an account, you will be ready to explore, find and log geocaches around the world. 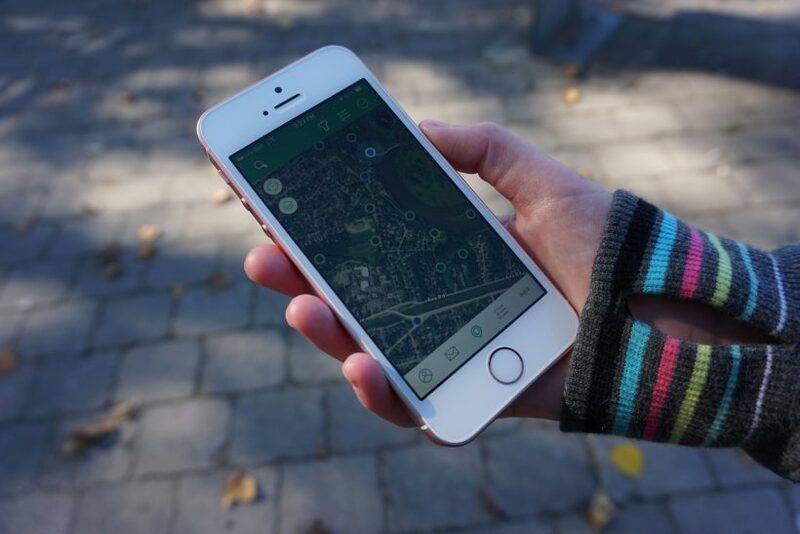 Geocachers use either the website or the official app (available for iPhone and Android) to pick a geocache and then use the phone’s GPS to navigate to the location and search for the cache. Once the cache has been found, geocachers sign and date the logbook that is with it, re-hide the cache exactly as it was found and share their experience online. There are millions of geocaches around the world so whether you are home or on vacation geocaching can be a fun outdoor adventure for families. As luck would have it, there is a mecca of geocaching in Brantford, Ontario just a short distance from our home in Southern Ontario. Brantford, located on the picturesque Grand River, is known for its extensive trail network that began as a system of dikes to protect the city from seasonal flooding and grew into a network of trails that is now more than 70km long. The area is referred to by geocachers as the Power Trail Capital and the trail system as the Brantford Power Trail since there are hundreds of caches located between Brantford and Port Dover. There are actually over 500 caches within a 20km radius of the Brantford Visitor & Tourism Centre which makes it a great place to start – particularly for first time geocachers. We stopped at the Visitor & Tourism Centre to obtain maps and directions to find parking and access the trails. Once we had a copy of the Brant County Outdoor Adventure Map we were ready to venture out. We decided to hike the trail along the Grand River in Brantford between Wilkes Dam and Waterworks Park. My daughter took charge of navigating with the GPS and was far better at it than I would have been. It was a beautiful early fall day and we had a great outing even though we only managed to find one cache. It turns out that caches can be trickier to find than one might think and I was quite relieved to have found at least one. Now that we have had some experience, I am certain we will be more successful on our next outing! We had worked up quite an appetite so headed to Blue Dog Coffee Roasters on Brant Avenue for a late lunch after our geocaching adventure. 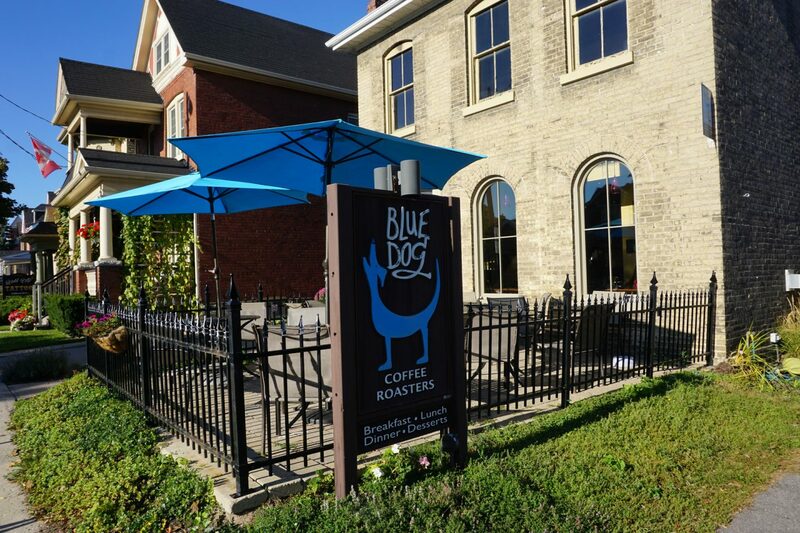 The Blue Dog, located in a brick heritage home, is a charming establishment serving freshly roasted coffee, delicious casual fare such as soups, sandwiches, salads and scrumptious sweets. The cafe also displays the work of a featured local artist each month and the artwork is available for purchase. 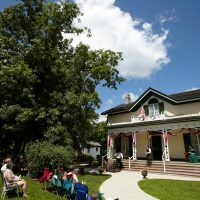 There are a number of interesting attractions to visit while in Brantford including The Bell Homestead National Historic Site which tells the story of Alexander Graham Bell and his invention of the telephone; the Brantford Farmers’ Market established in 1848; and the Brantford & Area Sports Hall of Recognition which recognizes hometown heroes including Wayne Gretzky. The Grand River watershed also provides ample opportunities for year-round outdoor activities including canoeing and kayaking, camping, swimming, fishing, birdwatching, cross-country skiing, and snowshoeing. The city’s Visitor & Tourism Centre is open daily 9-5 to provide assistance on all there is to see and do in Brantford. 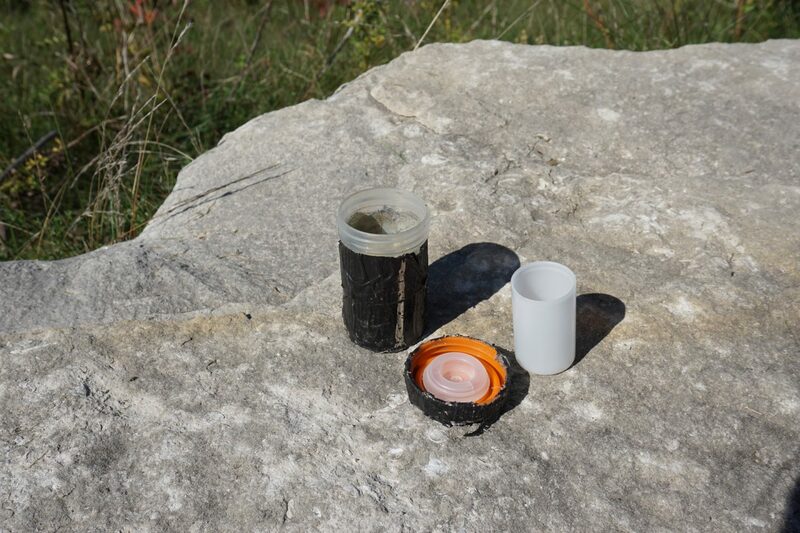 Additional information about geocaching is available on the Conservation Halton and Conservation Hamilton websites. Download the free Geocaching App before heading out and browse the caches located in your area. (The app is available from iTunes and is also available for Android users). There is a Premium version of the app available which has more features but is a paid monthly subscription. Some geocaches are Premium only. The free version is fine for beginners. Caches are rated by size, level of difficulty and terrain. On your first time out choose caches that have a 1/1 difficulty and terrain rating and that aren’t micro sized to improve your chances of success. Small family-friendly collectibles are often left inside the cache container as a memento. If you take one then you need to leave something of equal or greater value behind. Bring a pen or pencil with you in case the cache doesn’t have one so you can log your find. Be prepared. If you are headed into a wooded area be sure to take the same precautions you would if hiking. About the author: Lisa Goodmurphy is a Canadian mom, travel blogger and freelance writer who grew up in small town Northern Ontario and now resides near Toronto. Badly bitten by the travel bug years ago, she considers herself fortunate that her family is equally enthusiastic about her mission to explore the world – one trip at a time. You can follow her family’s travels on Gone with the Family, the blog that she founded in 2011, as well as on Facebook, Twitter, and Instagram. Mountain bikers looking for their next challenge will find plenty of inspiration in Hamilton Halton Brant.